Great Britain’s Pony Dressage Team scored a trio of medals at this year’s FEI Pony European Championships at Millstreet in Ireland (30th July – 3rd August). Team silver, an individual bronze and freestyle silver made it a successful five days. The team of Rebecca Bell, Alex Hellings, Bethany-Rose Horobin and Phoebe Peters arrived full of expectation and were hopeful of a medal after the 2013 team secured bronze at last year’s Championship in Italy. Phoebe and Rebecca were in that team but Bethany and Alex were both debutants in 2014. 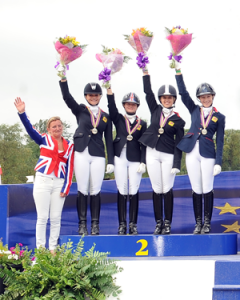 Four fantastic performances from all the riders with plus 70% scores, a record performance by British riders, including personal bests for Rebecca and Alex, secured silver for Britain, just 3% off gold, which went to Germany. It’s the team’s first silver since 2000. In the individual competition, hopes were high for last year’s double gold medallist, Phoebe Peters and her pony, SL Lucci. Sadly, it wasn’t their day when an early stumble proved difficult to recover from so medal hopes were dashed. She recovered to post a creditable 72.171% which gave her tenth spot. Bethany-Rose scored 70.878% for 12th place with Rebecca Bell in 17th with Valido’s Sunshine on 69.927%. 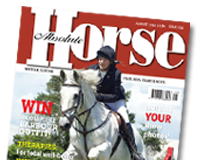 The star performer was debutante Alex Hellings with Der Kleine Lord who, at just seven years old, was one of the youngest ponies in the competition. At the end of the first day of the individual test, they held the advantage with a great score of 74.756%. Rivals from Germany and the Netherlands stole first and second in the second half of the competition, leaving Alex and ‘Lordy’ with a bronze at their first Championship. Team trainer Peter Storr commented; “I’m very pleased with the whole trip despite it being an emotional rollercoater. Team silver was an amazing result and we were oh so close to gold. To have four riders all score over 70% is a huge achievement and having the German and Dutch teams come to watch us as they felt threatened was testament to everyone’s hard work. I received a number of compliments from other nations on the way of our riders rode with real feeling and harmony.